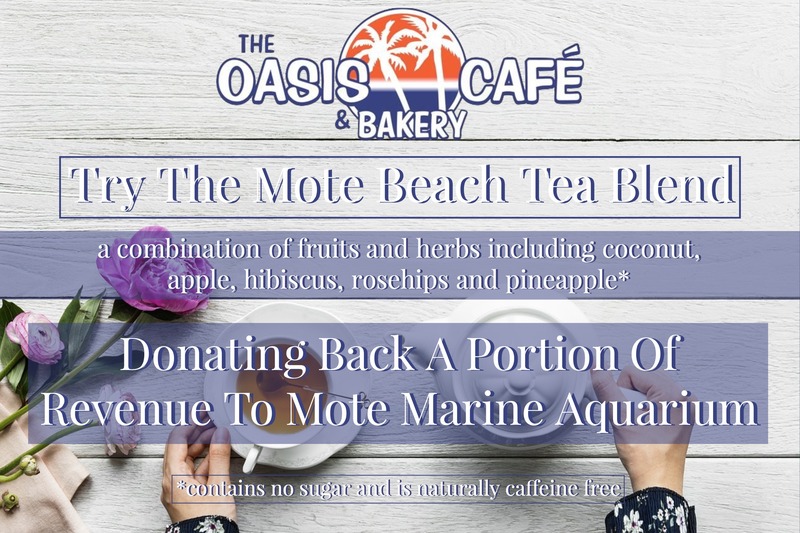 Throughout the month of March, Anna Maria Oyster Bar is partnering with The Women’s Resource Center for a clothing drive. 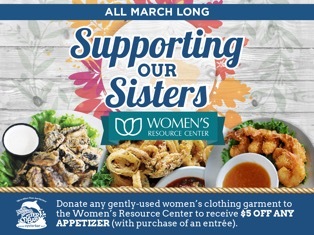 Donate any gently-used women's clothing garment to The Women's Resource Center and receive $5 off ANY appetizer from us with purchase of an entree! Our sisters at The Women's Resource Center are near and dear to our hearts. 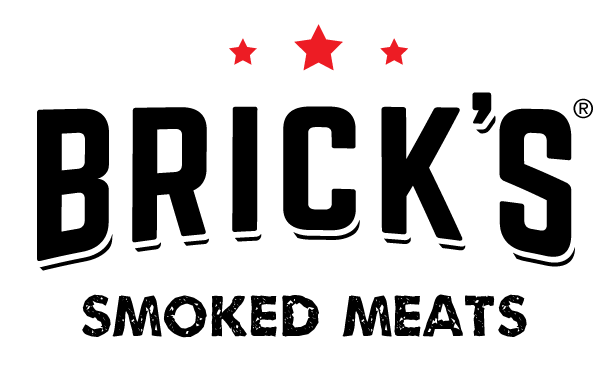 For more than 35 years, WRC has been dedicated to provide counseling, training and direction to women of all generations by encouraging, educating and empowering them through life's transitions. We know you are probably wondering why breakfast is the most important meal of the day. You might think that the recommendation not to skip breakfast is just good advice. Think about it, you need enough fuel to make it through the morning, right? But research has given even more reasons why breakfast is taking home the title of "most important meal of the day." "Breakfast is like exercising, if you make room for it in the morning, you'll look and feel great throughout the day." 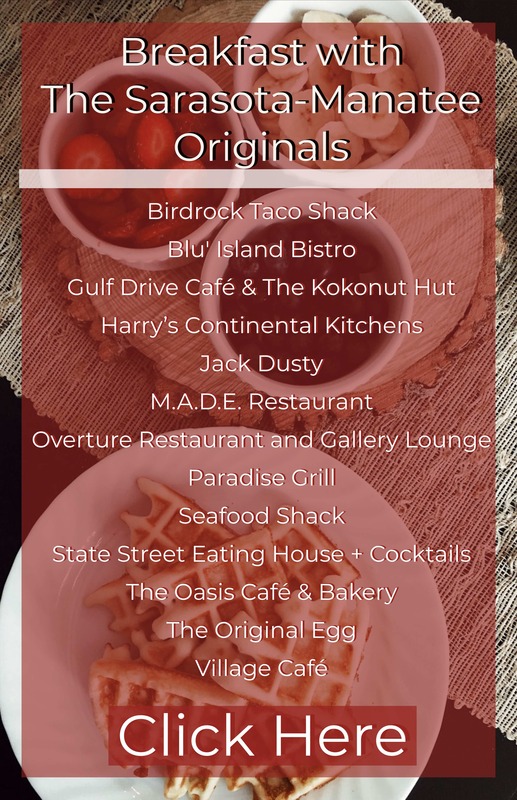 Visit 1 of 13 Sarasota-Manatee Originals' member restaurants, serving breakfast, for a healthy start to your day! Providing you with your daily nutrients, the Originals' can bring you a simpler way about keeping the good health! Read more on the article here! 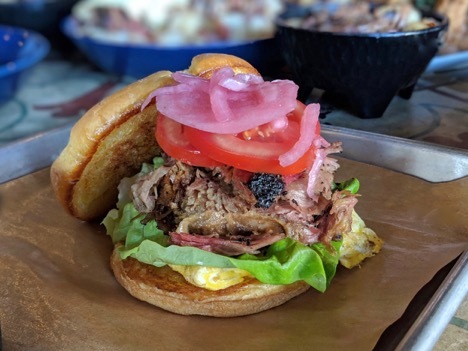 Brick’s Smoked Meats is now serving up Brunch on State Street and y’all, it does not disappoint. 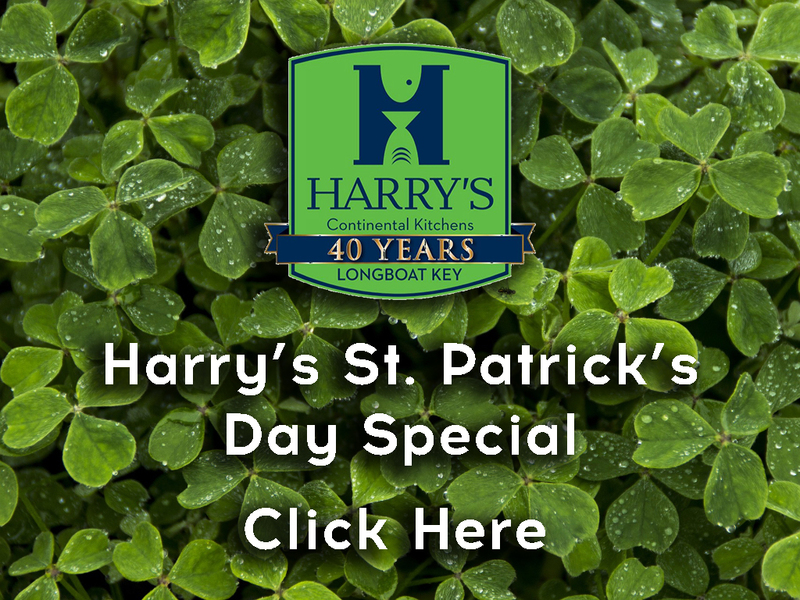 Stop in any Saturday or Sunday from 9:30am - 3:00pm to see what all the buzz is about. 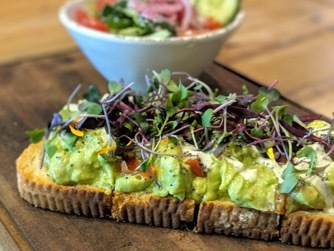 A perfect start to any brunch and great for sharing with the whole table! 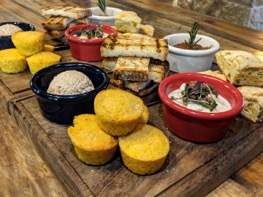 ★ Breads & Spreads - jalapeno cheddar biscuit, toast points, and corn muffins paired with cinnamon butter, honey burrata, and caramelized peach jam. 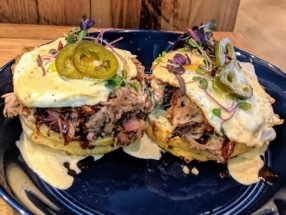 ★ BBQ Piggy Stack - scratch-made jalapeno cheddar biscuit made topped with bbq pulled pork, sunny-side-up eggs, and chipotle hollandaise. This finger lickin’ stack is garnished with microgreens, pickled jalapenos and served with our soon-to-be-famous Brisket Potato Hash. 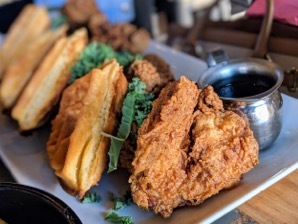 If you’re lookin’ for a one of a kind brunch entree, this is it. P.S. You’ll need more napkins. ★ Rise & Shine Platter- Brick’s take on a classic breakfast platter - but leveled up with your choice of smoked meat. 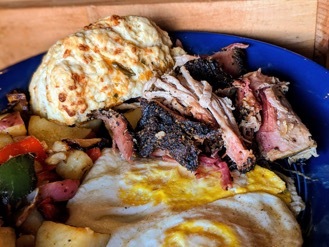 Two eggs your way; four ounces of Pulled Pork, House Sausage, USDA Prime Brisket, or Smoked Turkey Breast; a jalapeno cheddar biscuit; and Potato Hash. *Pro-tip: slather plenty of Spicy Brick’s sauce on top! If you’re looking for more of a creamy sweet crunchy indulgence - this is it! 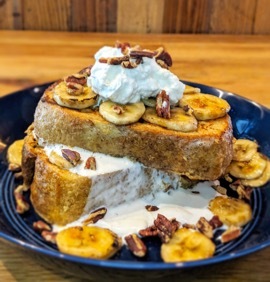 ★ Sweet Tooth - baked cinnamon french toast, topped with brûléedbananas, smoked pecans, and maple whipped cream. If you’re looking for a healthy alternative - here it is! 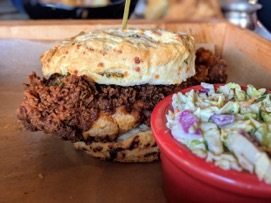 The Bun that launched Brunch at Brick’s. Our Farmer’s Market Special (previously only available Saturday mornings, while the Market is at our doorstep) got a glorious morning upgrade, and a new name. 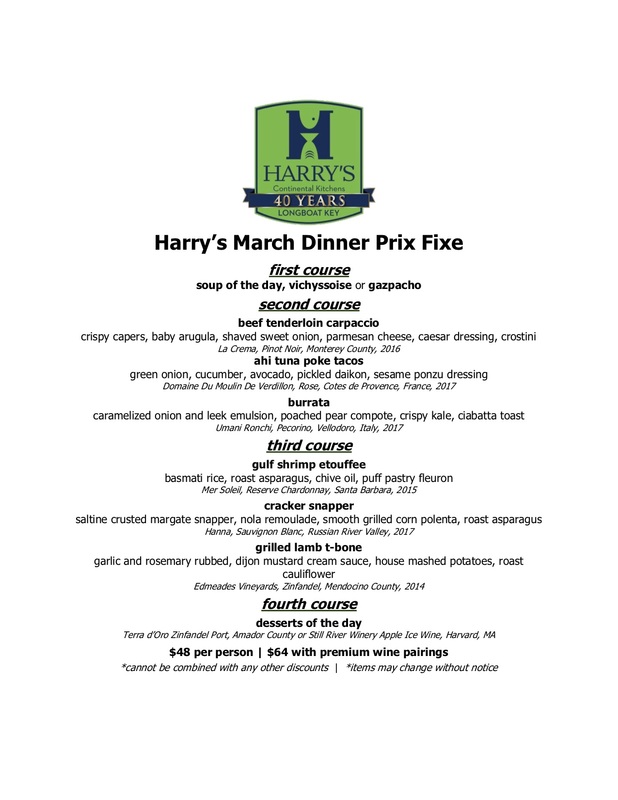 Join Harry's Continental Kitchens this March for their 'March Dinner Prix Fixe"